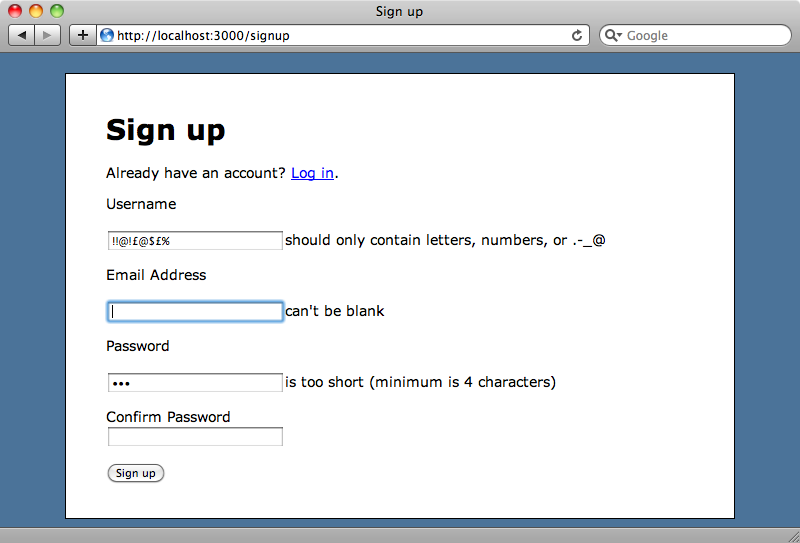 Showing validation errors inline as the user is filling out the form can lead to a better use experience. Learn how to do this using the Client Side Validations gem. The User model has a number of validators, including some required field validators, so if we submit this form without filling in any of the fields we’ll see a list of validation errors. To install the gem we just need to add a reference to it in the application’s Gemfile and then run bundle. We’re also going to need to modify client_side_validations’s configuration file. By default it’s configured to use SimpleForm and Formtastic but as we aren’t using either of those we’ll need to uncomment the section at the bottom of the file and override the field_error_proc method. # Uncomment the following block if you want each input field to have the validation messages attached. 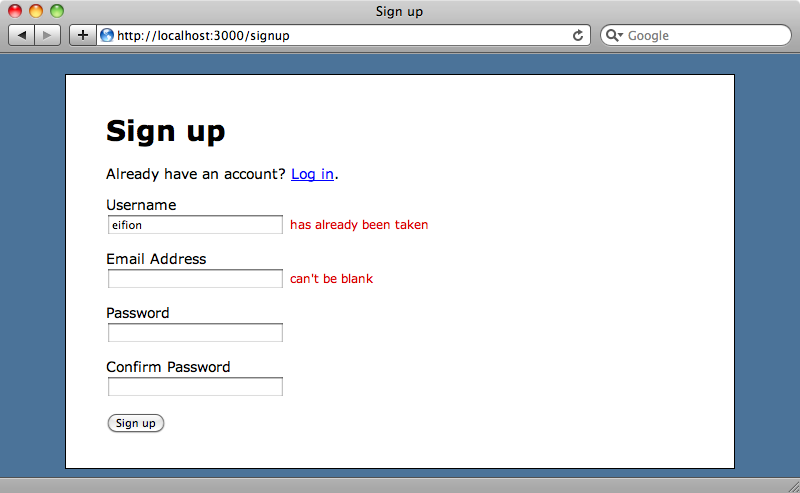 This method appends a label element containing the error message and with a class of message to any invalid fields. If the default way of displaying errors doesn’t fit in with our application then we can customize the file above to suit. There’s one more step we need to take. We need to add a :validate => true option to the form_for call for the form to which we want to add the validations. We now have everything in place to get validations working inline. If we reload the signup page now and tab out of the username field without entering a value an error message will be shown inline immediately and the same applies to any other fields with errors. Simple validations work out of the box but what about more complex ones? In the User model we have some other validations, one for the format of the username field that ensures that there are no unusual characters in it, one that checks the length of the password and one that checks that the confirmation matches the password. validates_presence_of :username, :with => /^[-\w\._@]+$/i, :allow_blank => true, :message => "should only contain letters, numbers, or .-_@"
While there are visible errors the form can’t be submitted but once we enter valid values into each field we can submit it and sign up. Some validations, such as validates_uniqueness_of, need to read data from the database. We want the username and email fields to be unique so let’s add this validation in and see what happens. We’ve already created an account for “eifion” and when we try creating another one the error is picked up as soon as we tab out of the username field. This works because client_side_validations makes an AJAX request when we tab out of the username field so that it can check on the server as to whether that username has already been taken. We want to customize the way that the error messages look so we’ll take a look now at the CSS necessary to do that. First we’ll style the field_with_errors class that Rails adds to invalid fields so that these elements are shown inline. The error message for a field is a label element with a class of message and we’ll style these to look a little more like error messages be colouring them red and adding a little padding to the left to move them away from the form element they’re associated with. 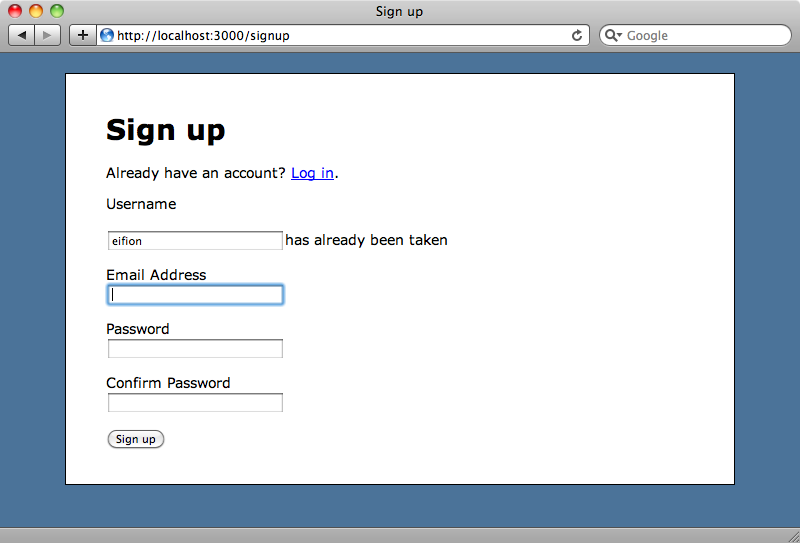 If we reload the sign up page now and cause some errors we’ll see the new styles. Thankfully there’s a page on the client_side_validations Wiki that explains exactly how to do this and so we’ll recreate the EmailFormatValidator in this application and then use the information on that page to extend it to work on the client too. The first step is to add the validator in a file in the application’s /lib directory. This class checks that the value passed in matches a regular expression and adds an error message to the model’s list of errors if the match fails. We could have used a simple validates_format_of to achieve this, but for the purposes of this example we’ve written a custom validator. Files in the /lib directory aren’t automatically included in the application in Rails 3. We’ll need to add that directory to the autoload_paths in our application’s application.rb file so that the files in there are added to the load path. # Configure the default encoding used in templates for Ruby 1.9. # Configure sensitive parameters which will be filtered from the log file. A custom validator needs to have its default error message defined inside a locales file. The error message needs to be nested under errors/messages and have a key that matches the name of the custom validator, in this case email_format. # Sample localization file for English. Add more files in this directory for other locales. # See http://github.com/svenfuchs/rails-i18n/tree/master/rails%2Flocale for starting points. email_format: "is not formatted properly." We can now add our new validator to the User model, using validates and passing in the name of the field we want to validate and the name of the validator. We can replace true in the code above with a hash of options to, say, specify a custom error message, but here we’ll just leave it at the default. In the code above we add our new validator by adding a new local validator called email_format to the clientSideValidations.validators object. Making it local means that all of the validator is performed on the client; if we added it to the remote validations then it would make an AJAX call to the server in the same way that the validates_uniqueness_of validator did earlier. Now that all of this is in place we can give it a try. If we reload the page and enter an invalidly formatted email address the error message will be shown as soon as the email field loses the focus. That’s it for this episode on client side validations. Writing custom validations might seem like a lot of work but once you’ve set up the first one, adding others is pretty straightforward. Getting instant feedback when filling in a form makes for a much better user experience and this is a great way to add them to your Rails applications.